A friend recently asked me where I find all of the recipes for my blog. Well, her question got me thinking about how my little blog and I have been evolving. When I first started blogging, I planned this to be a place where I could gather all of my favourite, tried and true recipes to share with family and friends. Then I found myself being exposed to all sorts of new and exciting recipes, techniques and cuisines. Blogging has been like opening up a treasure box, and has really inspired me to develop as a cook. It has ignited my excitement about cooking again, and now I find myself exploring reams of cookbooks and magazines, picking up tidbits, ideas and images that influence what I do in my kitchen, and what I blog about. About 6 months ago, my sister-in-law, introduced me to a sumptuous magazine from New Zealand, called “Cuisine”. Well, I have been cooking up a storm from these magazines, and discovering all sorts of new flavours and aromas. This experience has also brought home, the strong regional culinary differences in the English speaking world. Maybe I have been a bit naïve, but it is so much fun to pick up a magazine from another country and learn how they put together ingredients; how they interpret them, and to see how food trends may vary there. I am thoroughly smitten with this magazine. Today’s recipe is from the September 2014 issue of Cuisine magazine from New Zealand. I was so thrilled with the flavours in this dish; every bite was a surprise. I had never made miso butter before, but both my husband and I were yumming (don’t think this is a word yet) over this condiment. I hope you like this recipe as much as we did. One note about the recipe: I had a hard time keeping the rice balls together while I was frying them. I remade the rice twice. The first time, I let it dry out too much and the rice balls insisted on bursting while I was frying them. The second time, I made sure that the rice was good and sticky, but they still wanted to open up either during the frying process or quickly afterwards. If you try the recipe and find a trick to keeping them together, please let me know. I am bringing a lovely big platter of these rice balls over to Angie’s Fiesta Friday. The blogosphere’s best virtual blog party is still hopping after 35 weeks thanks to Angie and all of the dedicated co-hosts. If you haven’t checked out her blog, The Novice Gardener, you really must, and be sure to join us at Fiesta Friday! I discovered Miso Butter! What a delight! Soak rice in water and salt for 30 minutes. Bring to a boil, and reduce heat to low. Cover and simmer for 25 minutes. Remove from heat. Heat one tablespoon of sesame oil in a medium skillet and fry the ground beef over medium heat for 5 minutes or until browned. Meanwhile, whisk the butter, miso paste and sugar in a bowl until combined. Stir ¼ cup of the miso butter and white part of green onion into the beef. Reserve the remaining miso butter. Divide the rice into 8 portions, rolling them into balls. Make an indent in the centre. 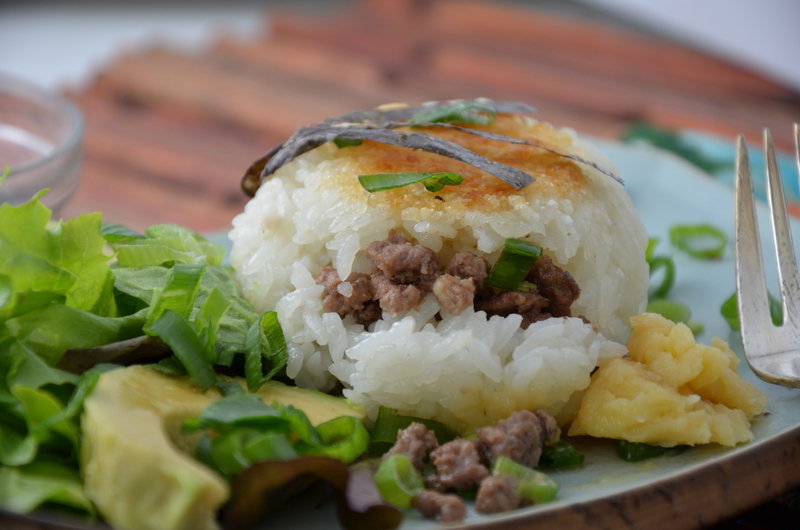 Place 1 – 2 tablespoons of the beef mixture in the centre and then enclose with the rice. Press the balls firmly back into shape. To make the salad dressing, whisk the remaining sesame oil, with the mirin, soy sauce, rice vinegar and sugar until the sugar has dissolved. Heat the frying pan over medium heat. Drizzle the rice cakes with sesame oil on both sides. Fry for 10 minutes on each side until golden and crisp. Toss the avocado and salad leaves with the dressing and serve with the rice cakes, with the remaining miso butter. Top the rice cakes with the sliced green onion and nori. The layers of flavour in this recipe are almost magic! Hey Justine! Thanks so much for your encouragement! Oh my gosh! That looks so delicious! 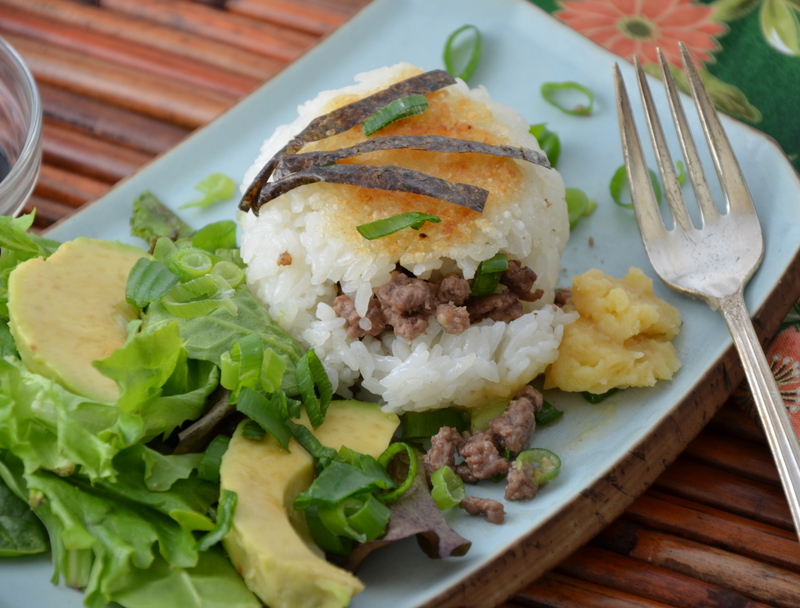 I’d have to substitute the meat since I don’t eat beef, but I love the crispy rice and the nori. And I’ve never had miso butter before, but that sounds so good. Miso is one of my favorite flavors! I love these very beautiful little rice balls Julianna! Very nice recipe! I have learned so much since I have started blogging! We share so much and we really support each others…It is a wonderful experience! I love your outlook on learning from new foods and cuisines, it’s always so exciting to discover something new. These rice balls are certainly something I’ve never heard of and they look amazing! These rice balls look delicious, Julianna! I’m definitely bookmarking this one…I bet these would make a great munchie on football Sunday…or Saturday…or Monday…or Thursday. Too much football for my tastes…aside from all of the great food I get to eat and prepare. 😀 Thanks for providing something new and exciting to serve! oh yum! I love rice balls! Gotta make this sometimes 🙂 Thanks for sharing with us at Fiesta Friday. I love listening to other foodies inspiration. I am always saying that I will never live long enough to make everything that I want! These rice beef balls are very unique, and while they may not have come out perfect in your opinion, I am sure that they tasted amazing! Hey Margot! So glad to meet another fan of this great foodie mag! I’m so happy with my subscription. It’s such a great find. Julianna, it seems you’ve read my mind! Blogging means receiving a lot of influences and inspiration. Your plate sounds amazing, thanks a lot for sharing! I hope you’ll have a great we. p.s I made your chicken with lavender…. it was unbelievable! Thanks again. So wonderful to hear about the chicken recipe 🙂 I made it again the other day and my husband and I still love it. It will become a classic in our home for sure! Hi Judi! Yes, I’ve seen that one on the magazine stand too. I’m wondering if they are related at all. So glad you like the sound of this recipe! Maybe we need another lifetime to make all of our bookmarked recipes? 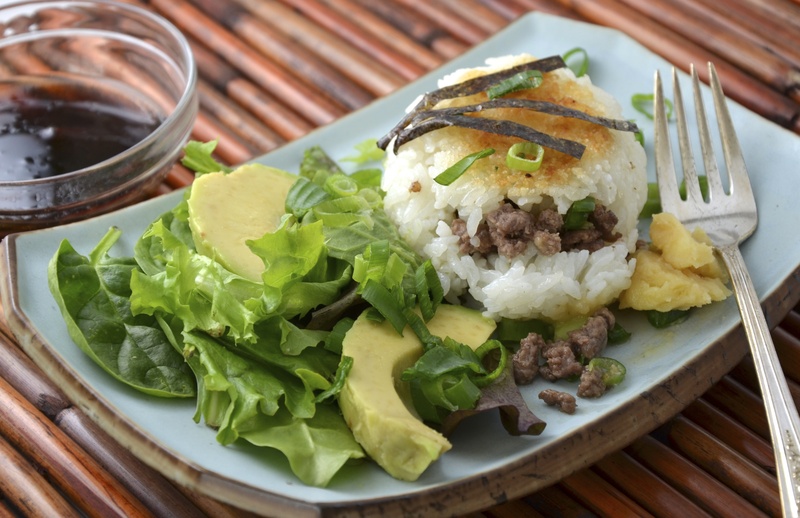 Rice balls look very tasty (and avocado is always good, yummy and healthy addition)! Thanks for sharing the info about the magazine, Julianna! ❤ I haven't heard about it, I'm excited to find out new recipes there! I’ve had rice balls before, but non quite like this. Looks delicious! Mmmm, I do like the sound of these rice balls.